The second day of the December Dag in de Branding Festival, Saturday 3rd brought an afternoon concert and Award presentation. Composer Martijn Padding was awarded the Johan Wagenaar Price of the Municipality of The Hague. The price is awarded every four years and is an oeuvre award. 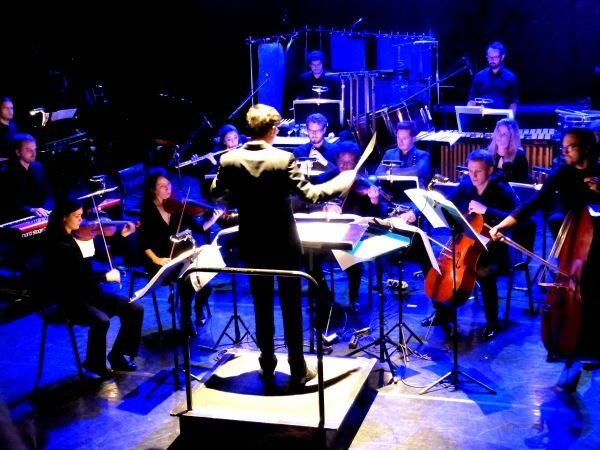 It is dotated with an amount of €15.000,- and the performance of compositions of the winning composer. The New European Ensemble conducted by Christian Karlsen played Padding's Slow Landscape with Thunder (soloist: Felicia van den End - bass flute), White Eagle (soloist: Heleen Hulst - violin) and Unequal Parts (soloist: Gerard Bouwhuis - piano). The real Night started as early as 19.00 hours at the Korzo Theatre. And straight off with a world premiere. Ensemble Klang performed Post by Mexican composer Alejandro Castaños. A composition in which Alejandro deepened some of his earlier works, but much more radical and more rich in contrast. It all start with a bang. A tremendous and heavy drum solo by Joey Marijs. Then some soft abrasive sounds followed by tranquil scattered notes. During the long notes the piano of Saskia Lankhoorn takes over layering a sounds of a meandering river over it. 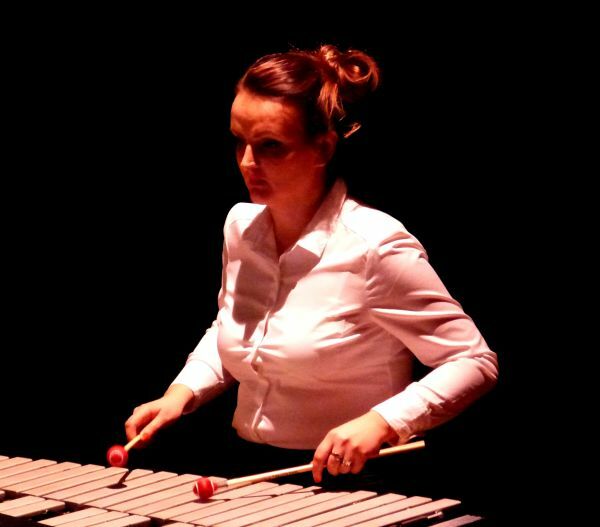 A more rhythmical part is played by percusion and piano. Followed by a multiphonic heavy outburst of all players, gradually flowing over in a unisono. Only to return in the finale to the former abrasive sounds, but with much more intensity. A lengthy applause befell Alejandro. At the same time as Kluster5 had their gig Ensemble Modelo62 played the adjacent music room. Modelo62 interpreted Hugo Morales composition Tonewood. Contacting the back of strings instrument (including piano) with an electronic wood toned soundscapes were generated by the players. They also played, in a with wind instruments, guitar and percussion extended line up, Keir Neuringer's Elegy for the Schoolboys at Ghazi Khan and Justin Christensen's Selfportrait, Reflection. In the foyer Ensemble Klang world premiered Matthew Wright's compostion Fast Gold Butterfly. All six members of Klang playing keyboard under electronic supervision by the composer himself. After this gig the brand new Cd of Matthew Wright's music by Ensemble Klang was presented. With the just heard Fast Gold Butterfly being one of the tracks. Back in the large hall the New European Ensemble, conducted by Christian Karlsen took the stage. Three pieces by Kate Moore were performed. The Dutch premiere of The Art of Levitation was first in line. A wonderful composition. Starting with a few players gradually increasing to including all the Ensemble. And from a soft beginning to a spectacular heavy finale. This was followed by an older composition of Kate: Klepsydra. Klepsydra is a water driven clock. In the composition Kate translates that into meandering soundscapes. The final Moore piece this evening was called Days and Nature. In terms of structure a bit like The Art of Levitation. Beginning in a tranquil way gradually exploding into a hefty composition. Albeit in a more rhythmical and dynamic context than the first played piece. And with the music being much more dramatic. The audience went mad with excitement and celebrated kate and the ensemble for quite some time. 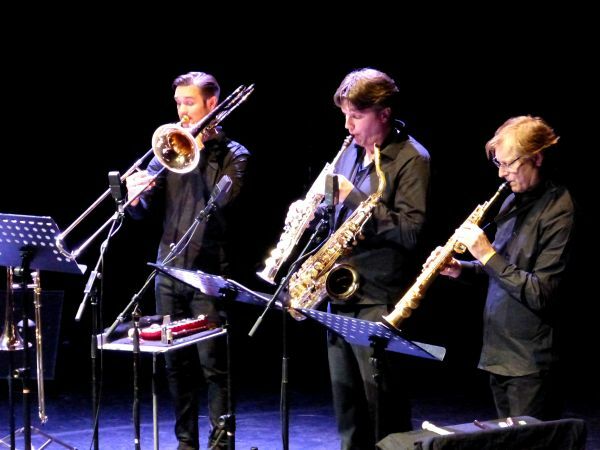 The Catchpenny Ensemble, a collective of composers and musicians consisting of former Royal Conservatory students, performed two works by American composer Missy Mazzoli: Like a Miracle and A Song for Arthur Russell. Both recycling short samples of sung sequences and combined with the instruments of the Ensemble. Then back to the main hall for Oscar Bettison's bluegrass masterpiece requiem O Death. It all starts with Chorus I and a magnificent trombone solo by Anton van Houten. Soon to be joined by the guitar. A melancholic movement to mourn the death. For the second part, Bone Chapel, the guitar sets the tone. Over this layer percussion and wind instruments intonate a hellish sequence. later on the piano plays a major part. And off course the banjo to accentuate the bluegrass 'grassroots'. After a lengthy fourth part, a kind of lament, in the next part Chorus II the trombone takes the lead again. A hefty sixth part called 'I believe I'm sinking down' is followed by a more serene finale:'Lights in Ashes'. 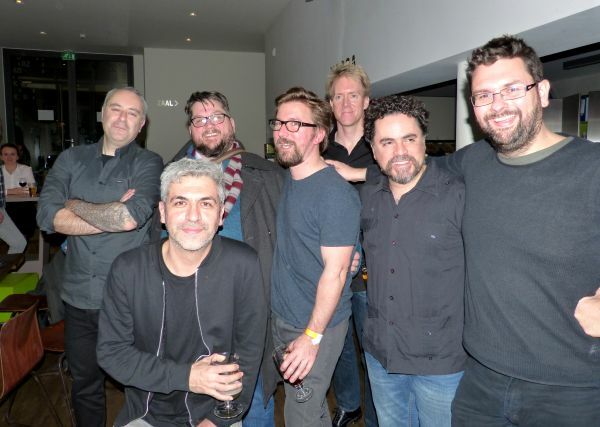 In front: Alejandro Castaños; From l. to r.: Oscar Bettison, John de Simone, Pete Harden, Justin Christensen, Carlos Itturalde and Matthew Wright. To round off the night the composers celebrated their reunion.